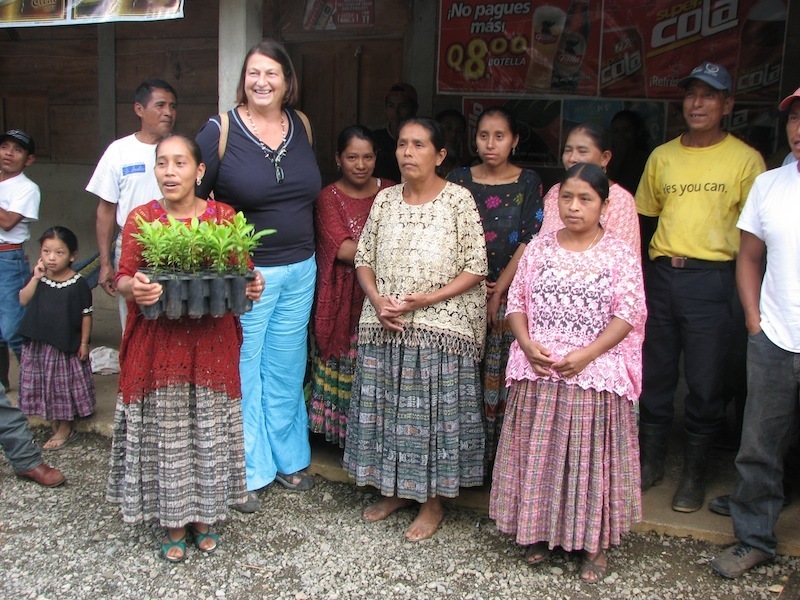 Kathy (in blue pants) delivers organic allspice seedlings to native growers in Guatemala. Back in her car after accepting the offer, the woman realized that she had never mentioned during her conversation that she was going to a Halloween party. She wondered if they would be expecting her to show up the next day in a black hat and cape. That impromptu interview and job offer had a profound influence on Frontier. The woman hired was Kathy Larson. Currently our Vice President of Sustainability, Kathy has been instrumental in helping make Frontier what it is today. Kathy has helped shape Frontier’s development over her three decades here in a wide variety of roles, managing areas as diverse as herbs, quality assurance and sustainability — and tackling everything from product specs to computer systems along the way. She was a key advisor — on the basis of her certified training as an herbalist and aromatherapist, and her lifelong success as a natural cook — in early decisions regarding product selection and development. Her knowledge was also utilized in the creation of promotional materials and usage information. Kathy wore many different hats through the years, fixing problem areas and further advancing successful ones. An avid herb, spice and aromatherapy user herself, she communicated knowingly about our products as a marketer. Her interest in the science of plants is evident in her knowledge of their quality components and even biochemistry. As an early Quality Assurance Manager, she established uncompromising product standards that established the position Frontier still enjoys as a quality leader. She would later use her technical knowledge to build a Frontier extract line from scratch, personally overseeing the onsite extractions. The expertise Kathy developed in herbs, sustainability, and organics is prized by the natural products industry. Kathy has spoken at conferences in this country and abroad, served on board of the American Herbal Products Association and been a member of The Sustainable Food Trade Association. Over the years, she has participated in work groups and committees addressing key industry issues. Kathy and her husband, Dave, enjoying themselves at the 2009 I-Renew Renewable Energy and Sustainability Expo held at Frontier’s Norway site. Growing up on a small family farm, Kathy felt a deep connection to plants from an early age, an interest that only intensified as she grew older. Her diverse, carefully tended half-acre garden — as well as her work at Frontier — is testament to her continuing love of plants. Her enthusiasm for learning about growing and using plants found a perfect match in Frontier. She brought a strong understanding of plants and plant products based on personal experiences that ranged from putting seeds in the ground to flavoring food and addressing ailments. It was exactly the expertise the young Frontier co-op needed. Kathy still loves to learn about plants, find the best of their kind (she doesn’t love traveling itself but appreciates what she learns from it) and share what she knows — whether it’s recipes and usage tips or scientific quality data. a school and dishes out lunch to the schoolchildren. Helped shape Frontier’s standard of absolute transparency in providing information — from ingredients on the label to how we answer customer questions. Served several terms on early Boards of Directors when crucial precedents about our co-op structure, business practices and commitment to values were determined. Has personally engaged in Frontier’s social responsibility programs, such as feeding schoolchildren in India and providing organic allspice seedlings to Mayan growers. Has always championed a respect for nature that encompasses our environment, plants, animals, and other human beings — inspiring and grounding those of us who work with her. When Kathy retires this spring, she will be leaving a Frontier that is mind-blowingly different from the tiny, hippie-run enterprise she pulled up to in her witch’s costume in 1981. Kathy’s hard work, commitment and character have helped Frontier grow and prosper in keeping with the co-op’s initial idealism. Her legacy at Frontier can be summed up simply — she cared about what was really important. The many contributions of her 33 years at Frontier have been essential to Frontier becoming a co-op that cares about what’s really important. This entry was posted in Natural health, Sustainability by Cayenne Room. Bookmark the permalink. Kathy’s passion is so evident in working with, and for her. I had that privilege, arriving to work a year after her (1982), and helped with transitions and progress, over the years. I wish KKL the very best in future endeavors, and tending in her own retirement. 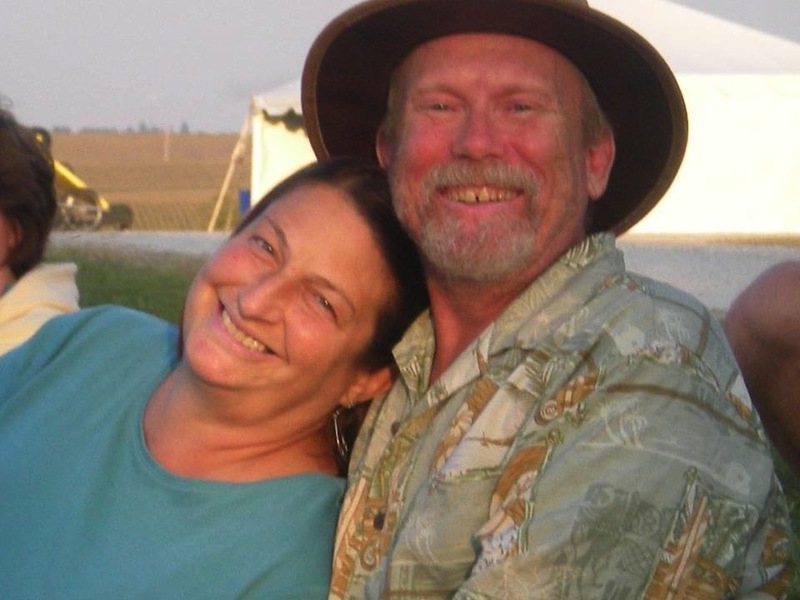 Her husband, Dave, also impacted the cooperative business, as his carpentry talents were used over many years. People come into our lives for a reason. Kathy has been such a good herbal teacher to the many who have walked the aisles of the natural foods warehouse. Sharing her knowledge and expertise, has been a blessing to us. Happy Retirement, Kathy! Hugs to you and Dave!